For the 1894 Rudyard Kipling story, see Rikki-Tikki-Tavi. Tikki Tikki Tembo is a 1968 picture book written by Arlene Mosel and illustrated by Blair Lent. The book tells the story of a Chinese boy with a long name who fell into a well. It is a sort of origin myth about why Chinese names are so short today. The book is controversial because it appears to retell a Japanese story and because it does not portray Chinese culture accurately. Tikki Tikki Tembo is set in ancient China and invents an ancient Chinese custom whereby parents honor their first-born sons with long, elaborate names that everyone is obliged to say completely – no nicknames, no shortening of any kind – while second-born sons are typically given short, unimportant names. 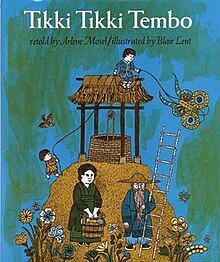 A boy named Tikki Tikki Tembo-no Sa Rembo-chari Bari Ruchi-pip Peri Pembo ("The Most Wonderful Thing in the Whole Wide World") and his little brother Chang ("Little or Nothing") are playing very close to a well at their house that their mother has warned them to avoid. Chang falls in the well and his older brother runs to their mother and tells her Chang has fallen down the well. Their mother tells him to get the Old Man with the Ladder. He goes and tells the Old Man. Chang is rescued and then recovers quickly. Some time later, the boys are again playing near the well. This time, the older brother falls in. Chang runs to their mother and tries to tell her that "Tikki Tikki Tembo-no sa rembo-chari bari ruchi-pip peri pembo has fallen into the well." At first she cannot hear him so he says it again. However, because Chang is out of breath from running he sputters and then mispronounces the name. His mother insists that he repeat the name—but with respect. He tries repeatedly until finally his mother tells Chang to get the Old Man with the Ladder. Chang goes to the Old Man with the Ladder. Initially, the old man does not respond because he is asleep. Further, when Chang tries to wake him up, the Old Man with the Ladder—annoyed—tries to fall back asleep. After Chang breathlessly repeats his brother's predicament the Old Man goes with Chang to save his brother from the well. They get Tikki Tikki Tembo-no Sa Rembo-chari Bari Ruchi-pip Peri Pembo from the well, but because of the long time he was in the well, it takes longer for him to recover. The end of the story says that this is why the Chinese have short names. The book received accolades upon publication. The Kirkus Review found the illustrations to be "a skillful counterpoint of diminutive detail and spacious landscape and a fine setting for a sprightly folktale." The book won a 1968 Boston Globe–Horn Book Award in the Picture Book category. In 1997, The New York Times selected it as one of the 50 best children's books of the previous 50 years. In a 1999–2000 National Education Association online survey of children, the book was one of the "Kids' Top 100 Books". Based on a 2007 online poll, the National Education Association named the book one of its "Teachers' Top 100 Books for Children". In a 2008 online poll of "Top 100 Picture Books" by School Library Journal, the book ranked 35th; in a similar 2012 poll, the book ranked 89th. According to the publisher, over one million copies of the book had been sold by 2013. The 2009 audio book version of the story received a Parents' Choice Foundation rating of "Approved". The publisher states that the author "first heard the story ... as a child" and that the book is "her own retelling" of it. However, the story is thought to have come from Japan rather than from China. Specifically, it has been suggested that the story originated from the very similar Japanese rakugo about Jugemu Jugemu Gokō-no surikire Kaijarisuigyo-no Suigyōmatsu Unraimatsu Fūraimatsu Kūnerutokoro-ni Sumutokoro Yaburakōji-no burakōji Paipopaipo Paipo-no-shūringan Shūringan-no Gūrindai Gūrindai-no Ponpokopī-no Ponpokonā-no Chōkyūmei-no Chōsuke. In 1924, the National Association of Junior Chautauquas published a book that contained a story by an anonymous author entitled "Tiki-Tiki-Tembo"; the story concerned a boy "in old Japan" named "Tiki-tiki-tembo-no sa rembo-Hari bari broohski-Peri pen do-Hiki pon pom-Nichi no miano-Dom bori ko." Toward the end of the 1924 story, it is stated that after falling into the well, the title character "never grew up to be a fine Japanese man." A book published in 1968 (the same year as Tikki Tikki Tembo) reprinted the 1924 version of the story. It is possible that a recorded 1960 version of the story called "Long-Name-No-Can-Say" with a fat elder brother named "Nicki Nicki Tembo No So Rembo Oo Ma Moochi Gamma Gamma Goochi" was the first to change it to a Chinese setting. A similar story is told in the American folksong "(Eddie Kucha Kacha Kama Tosa Nara Tosa Noma) Sama Kama Wacky Brown" recorded in 1960 by the Brothers Four on their eponymous first album; the title character "fell into the deep, dark well" and drowned. A story published in 1961 by Golden Press, called "The Little Boy With the Long Name", featured an older brother named "Sticky Sticky Stumbo Nos E Rumbo E Pro Pennyo Hara Bara Brisko Nicky Prom Po Nish No Mennyo Dumbricko". The 1961 story ends with the boy's death by drowning, which was ironic because the parents had believed that giving children long names would cause them to live long lives. It has been criticized for "reinforc[ing] the stereotype that Asian names sound like nonsense syllables", especially as the name of the title character is nothing like actual Chinese and the common name Chang (pinyin Zhāng) is a surname and not a given name. No similar Chinese word means "little or nothing". The mother's dress resembles a Japanese kimono. The titular character appears to wear Japanese wooden sandals (geta). During the second visit to the well, on the "Festival of the Eighth Moon" (presumably meaning the Mid-Autumn Festival), the boys eat rice cakes instead of mooncakes. When Chang addresses his mother, he is depicted bowing backwards. Scholastic records released an LP record of the story in 1968. Weston Woods Studios produced a filmstrip and cassette tape version in 1970, which was later distributed on VHS and DVD. In 1971 Canadian composer Harry Freedman set the story to music. His 10-minute work, entitled Tikki Tikki Tembo, is scored for narrator and woodwind quintet. A 1975 jazz album Brown Rice by Don Cherry contains the song "Brown Rice", in which the artist refers to Tikki Tikki Tembo. A 1990 punk rock album by the band Cringer was titled Tikki Tikki Tembo No Sa Rembo Chari Bari Ruchi Pip Peri Pembo. The 2003 Christmas decorations at the White House included a depiction of a scene from Tikki Tikki Tembo. A song by Welsh group Anweledig on their 2004 EP Byw is titled "Tikki Tikki Tembo" and tells some of the story. The 2010 song "Wildstyle Method" by Bassnectar says Tikki Tikki Tembo's full name during certain parts of the song. A variation of the tale was featured in an episode of Lamb Chop's Play-Along. ^ Mosel, Arlene. Tikki Tikki Tembo. New York and Chicago: Holt, Rinehart and Winston, 1968. ^ "Tikki Tikki Tembo (review)." Kirkus Reviews, March 25, 1968. Accessed February 5, 2013. ^ "Past Boston Globe — Horn Book Award Winners." May 30, 2011. Accessed February 5, 2013. ^ Staino, Rocco. "Caldecott-Winning Blair Lent Dies at 79". School Library Journal, February 4, 2009. Accessed February 5, 2013. ^ "CHILDREN'S BOOKS; 50 Years of Children's Books". The New York Times, November 16, 1997. Accessed February 5, 2013. ^ National Education Association. "Kids' Top 100 Books". Archived from the original on February 1, 2013. Retrieved February 5, 2013. ^ Bird, Elizabeth (April 16, 2009). "Top 100 Picture Books Poll Results (#35-31)". School Library Journal "A Fuse #8 Production" blog. Retrieved February 12, 2013. ^ Bird, Elizabeth (May 18, 2012). "Top 100 Picture Books #89: Tikki Tikki Tembo by Arlene Mosel, illustrated by Blair Lent". School Library Journal "A Fuse #8 Production" blog. Retrieved February 12, 2013. ^ a b "Tikki Tikki Tembo". Macmillan Publishers. Retrieved February 12, 2013. ^ Joy, Flora. "Tikki Tikki Tembo". Parents' Choice Foundation. Retrieved February 12, 2013. ^ Chen, Minjie (Spring 2009). "Seeking Accurate Cultural Representation: Mahjong, World War II, and Ethnic Chinese in Multicultural Youth Literature". Multicultural Education. 16 (3): 2–10. Retrieved January 26, 2013. ^ Yang, Jeff. "Born to Rebel", San Francisco Chronicle, March 25, 2009. ^ a b Anonymous. "Tiki-Tiki-Tembo." In: National Association of Junior Chautauquas. Through Story-Land with the Children. New York [etc. ]: Fleming H. Revell Co., 1924, pp. 31–34. LC 24022123. OCLC 8693565. ^ "Tiki-Tiki-Tembo." In: Hardendorff, Jeanne B. The Frog's Saddle Horse and Other Tales. Philadelphia and New York: J. B. Lippincott, 1968, pp. 40–45. LC 6810772. OCLC 436253. ^ Wing, Paul (narrator). "Long-Name-No-Can-Say (Nicki Nicki Tembo): A Chinese Fable." In: Day, Dennis, et al. Walt Disney's Snow White and the Seven Dwarfs also Long-Name-No-Can-Say (LP recording). Camden, NJ: RCA Victor, 1960 (Children's Bluebird Records, LBY-1044). OCLC 16120265. ^ Beeson, Kristine Diane Locatis, et al. "Tikki Tikki Tembo." Kadyellebee blog, January 2, 2002. ^ The Brothers Four. The Brothers Four (LP recording). New York: Columbia, 1960 (CL 1402). LC 93705344. OCLC 15100364. ^ BetteJo. "Sticky Sticky Stumbo Revisited." Being BetteJo blog, September 23, 2008. ^ a b Untermeyer, Bryna, editor. "The Little Boy With the Long Name." In: Untermeyer, Bryna, and Louis Untermeyer, editors. Big and Little Creatures (The Golden Treasury of Children's Literature, Volume I). New York: Golden Press, 1961, pp. 164–169. LC 624314. OCLC 6431887. ^ Yamate, Sandra. "Asian Pacific American Children's Literature: Expanding Perceptions About Who Americans Are." Using Multiethnic Literature in the K-8 Classroom, pp. 95–128. Christopher-Gordon Publishers (1997). ISBN 0-926842-60-9. ^ Cai, Mingshui (1994). "Images of Chinese and Chinese Americans Mirrored in Picture Books". Childrens Literature in Education. 25 (3): 169–191. doi:10.1007/BF02355394. ^ a b c Cai, Mingshui (2002). Multicultural Literature for Children and Young Adults: Reflections on Critical Issues. Westport, CT: Greenwood Press. p. 108. ISBN 0-313-31244-3. This name [Tikki Tikki Tembo...] does not sound like Chinese, ancient or modern. As portrayed in illustrations, the buildings, the dress, and hairdo of the lady, and the clogs worn by children are in the Japanese rather than Chinese style. ^ Various. "Tikki Tikki Tembo and Cultural Accuracy in Folktales." Archived 2007-11-25 at the Wayback Machine Child_Lit Listserv Archive. June 4–10, 1998. Accessed February 18, 2013. ^ Mosel, Arlene. Tikki Tikki Tembo (LP record). Narrated by George Rose with music by Joseph Raposo. Weston, CT: Weston Woods Studios, 1970. OCLC 2945747. ^ Mosel, Arlene. Tikki Tikki Tembo (filmstrip, cassette, and booklet). Narrated by Peter Thomas with music by Howard Rovics. Weston, CT: Weston Woods Studios, 1970. OCLC 6638461. ^ Mosel, Arlene. Tikki Tikki Tembo (VHS). Narrated by Peter Thomas with music by Howard Rovics. Weston, CT: Weston Woods Studios, 1985. OCLC 12055672. ^ Schindel, Morton, et al. Tikki Tikki Tembo and More Favorite Tales (DVD). Narrated by Peter Thomas with music by Howard Rovics. Norwalk, CT: Weston Woods Studios, 2005. OCLC 60565621. ^ "Cringer - Tikki Tikki Tembo No Sa Rembo Chari Bari Ruchi Pip Peri Pembo". Digital Meltd0wn Music Blog. Accessed February 3, 2013. ^ Administration of President George W. Bush. "The White House Christmas 2003. Tikki Tikki Tembo as retold by Arlene Mosel." U.S. National Archives and Records Administration. Accessed February 5, 2013. Kara, Çiğdem (Winter 2011). "Tiki Tiki Tempo: Localization of the Child With a Long Name Into Turkish Context" (PDF). Turkish Studies: International Periodical for the Languages, Literature and History of Turkish or Turkic. 6 (1): 1353–1365. Rideout, Irene (April 6, 2012). "Rethinking Tikki Tikki Tembo". GraceLinBlog: Happenings in the Life of Children's Author Grace Lin.